If you are a fan of XWiki, or you haven’t had a chance yet to try it, here is your chance to see how easy it is to use with Jelastic. XWiki is a free wiki software platform written in Java that is pretty cool and useful. BTW XWiki Enterprise is edited by both, the XWiki Community and XWiki SAS. It allows for the storing of structured data and the execution of server side script within the wiki interface. 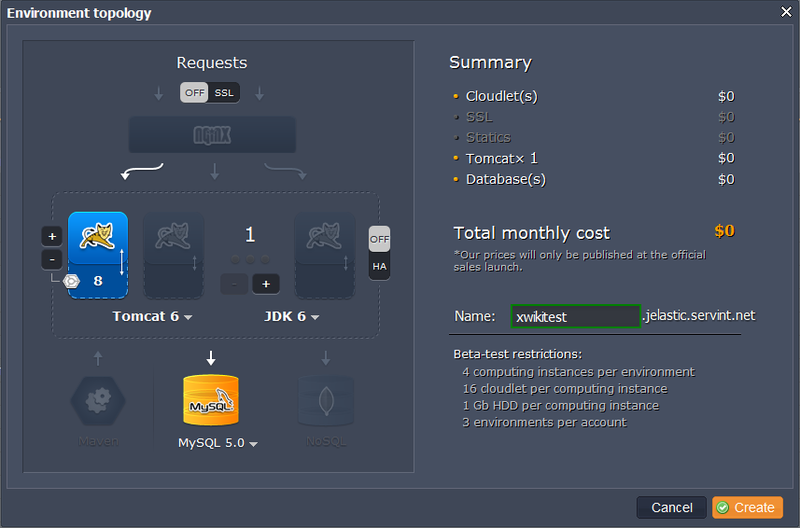 Let’s deploy XWiki to Jelastic cloud right now! 3. In the Environment Topology dialog, pick your application server (for example, Tomcat 6) and the database you want to use (for example MySQL). Then specify your environment name, for example, xwikitest. It will take just a minute for your environment to be created. 1. Navigate to xwiki.org and download the latest XWiki distribution WAR. 2. Go back to Jelastic and upload the package you have just downloaded to the Deployment manager. 3. Once the package is in Jelastic, deploy it to your environment. 1. Click the Open in browser button for MySQL. 2. When you created the environment, Jelastic sent you an email with credentials to the database. 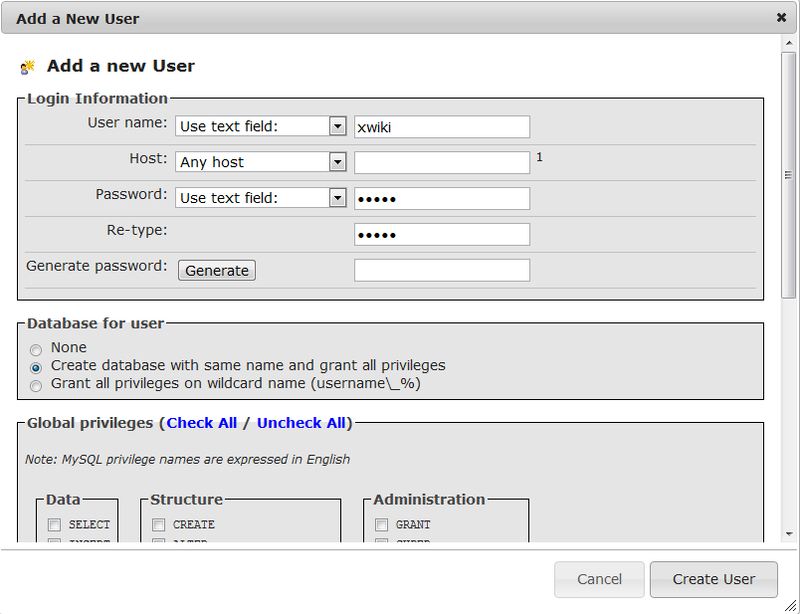 Use these credentials to create a user account and the database with the application. 1. Upload MySQL connector to the lib folder . 2. 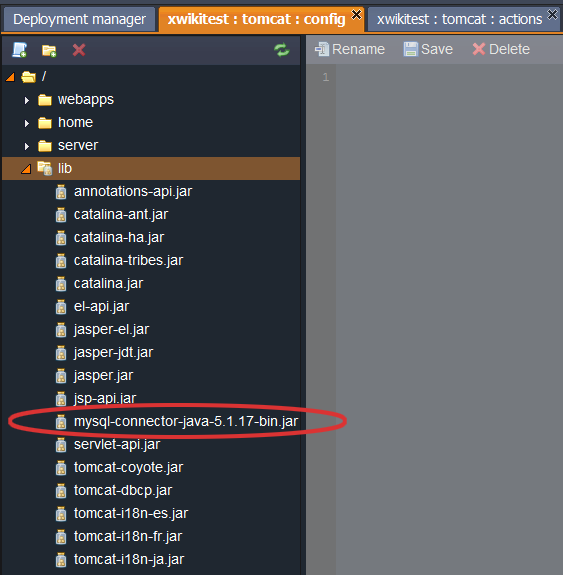 Pick Config for Tomcat and change hibernate.cfg.xml file (webapps/ROOT/WEB-INF): comment the part of file which is responsible for the default database configuration, uncomment MySQL configuration and type the correct database connection URL, your database name and password. Save the changes and restart Tomcat! Now you can open XWiki in a browser and create your spaces and pages there. Enjoy! With the “One click” install option you can have XWiki up and running within minutes. Our application packaging gives you rapid and stable multitenancy. The process is simple. Just a few clicks and you are done. Navigate to our Solutions page, select XWiki from the list of available apps and get it hosted in a minute, skipping the steps of manual installation. You can find more details about Jelastic App Packaging here.